Brian Keith Bloom (born June 30, 1970) is an American actor, voice actor and screenwriter. He is perhaps best known as the voice of Captain America in The Avengers: Earth's Mightiest Heroes and Marvel vs. Capcom 3: Fate of Two Worlds, Varric in the Dragon Age series, B.J. Blazkowicz in the Wolfenstein series, Nick Reyes in Call of Duty: Infinite Warfare and Pike in The A-Team, the latter two of which he also co-wrote. After leaving the soap opera, Bloom starred in several made-for-television films with teen subjects, including Crash Course (1988), Dance 'til Dawn (1988) and Desperate for Love (1989). This opened his appeal to later roles, which would include spots in Melrose Place, 2000 Malibu Road, CSI: Miami, Law & Order: Special Victims Unit, Drive and HBO's Oz. He played the role of fanatical cult leader Jonas Sparrow in the Joss Whedon show Dollhouse. Bloom also starred in a series of 1994 television movies playing Bandit, a part loosely based on the Burt Reynolds role. Bloom continues his working relationship with Carnahan, playing private mercenary antagonist "Pike" in the 2010 movie The A-Team, which Bloom also co-wrote with Carnahan, who directed the 20th Century Fox feature based on the television series. Brian also attended the Sheriff’s Academy and served as a Reserve Deputy with the Orange County Sheriff’s Department from 2001 – 2011. He is a certified self defense expert and a Sifu of a rarefied street lethal modern Self Defense System called “Bojuka”. He has participated in combat seminars and taught use of force techniques to law enforcement, military and private security worldwide. In 1997, Bloom developed and ran a .com hub known as AnimalWorldNetwork.com. The website was an outpost for pet products, information, video content and celebrity pet lifestyle coverage, selling and shipping fair-trade, organic and holistic pet supplies with both brick and mortar locations and a robust online presence. Bloom sold the domain and business in 2007 for an undisclosed eight-figure deal. Bloom is well known for his long standing association with the Call of Duty franchise, having performed voice over and motion capture work in a majority of the franchise titles culminating with the role of Captain Nick Reyes in Call of Duty: Infinite Warfare, a first-person shooter video game developed by Infinity Ward and published by Activision. Bloom is both the player character, modeled on his likeness, and the writer of the game's acclaimed narrative, for which he was nominated for Outstanding Achievement in Video Game Writing by The Writers Guild of America. 1984 ABC Weekend Special Tony DiSpirito Episode: "A Different Twist"
1989 Beauty and the Beast Cameron Benson Episode: "The Hollow Men"
1989 21 Jump Street Michael Capeman Episode: "Next Victim"
1989 Live-In Eric Episode: "Kissing Cousin"
1989 Matlock Tony Morgen Episode: "The Good Boy"
1989 Empty Nest Jimmy Episode: "You Are 16 Going on 17 and I'm Not"
1991 Over My Dead Body Johnny Mason Episode: "An Actor Prepares"
1995 Touched by an Angel Clayton Martin Episode: "Unidentified Female"
1996 The Nanny John Episode: "The Cradle Robbers"
2003 CSI: Crime Scene Investigation Kent Rifkin Episode: "Assume Nothing"
2003 Sealab 2021 Beck Bristow (voice) Episode: "Meet Beck Bristow"
2004 L.A. Dragnet Brett Thorson Episode: "Abduction"
2004 CSI: Miami Scott Riley Episode: "Crime Wave"
2005 Law & Order: Special Victims Unit Gabriel Thomason Episode: "Strain"
2006 CSI: NY Dr. Craig Zimmer Episode: "Cool Hunter"
2006 Cold Case Roger Felice Episode: "Baby Blues"
2007 Without a Trace Christopher Douglas Episode: "Lost Boy"
2008 Terminator: The Sarah Connor Chronicles Carter Episode: "Heavy Metal"
2009 Dollhouse Jonas Sparrow Episode: "True Believe"
2014 Call of Duty: Advanced Warfare Additional Voices Grouped under "Additional Cast"
^ a b "11: Brian Bloom - Writer/Actor/Voice Actor - The Doorpost Project". Retrieved January 17, 2017. ^ TV.com. 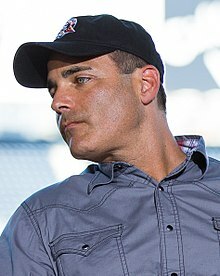 "Brian Bloom". Retrieved January 17, 2017. ^ Crecente, Brian (August 19, 2016). "Redesigning Call of Duty". Retrieved January 17, 2017. ^ Wheatley, Cliff (March 14, 2014). "Avengers Confidential: Black Widow and Punisher Review". IGN. Retrieved August 13, 2015. ^ "Hyperion". Avengers Assemble. Season 1. Episode 6. July 28, 2013. Disney XD. ^ BioWare (December 20, 2011). Star Wars: The Old Republic. Electronic Arts, LucasArts. Scene: closing credits, 9:50 in, English Cast. ^ "Gears of War: Judgment Credits". Microsoft Game Studios. Retrieved November 19, 2014. ^ Sledgehammer Games. Evolve. Activision. Scene: Credits, 10:54 in, Voice Over Performers. ^ "Call of Duty®: Infinite Warfare Developers LIVE with PlayStation's Sid Shuman". YouTube. Retrieved June 4, 2016. ^ Boyle, Joshua (November 17, 2018). "November Patch Update 17.11.18". Quake Champions. Retrieved November 17, 2018.